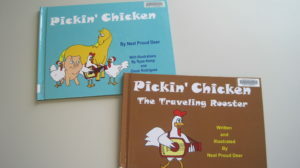 Come meet the local author of the popular children’s book series, “Pickin’ Chicken”. There will be stories, games and even chicken feed for a snack. This event is free, begins at 2pm and is part of our summer reading program, Reading Takes You Everywhere!